NBA Finals: Under Armour, 1. Nike, 0. Stephen Curry may become 'Golden' boy of Madison Ave. The NBA Finals aren't just a matchup of LeBron James and his Cleveland Cavaliers vs. Stephen Curry's Golden State Warriors. It's also a head-to-head (or foot-to-foot?) battle between athletic apparel giants Nike and Under Armour. And after Game 1, Under Armour is winning -- despite LeBron's monster night in an overtime thriller. LeBron has his own line of Nike (NKE) sneakers. Nike, like LeBron, already has a championship pedigree. But Under Armour (UA) and Curry want to show the world that they are the new kings of basketball. Related: Can Steph Curry be an ad star like LeBron? Here's a more detailed look at how the two companies stack up against each other. The stats. Nike remains the dominant player in the industry. The company reported sales of $7.5 billion in its most recent quarter. The stock is in the blue chip Dow Jones industrial average. Nike is worth $88 billion. By way of comparison, Under Armour's latest quarterly sales were $805 million. And the company's market value is $17 billion. But Under Armour -- the David to Nike's Goliath -- has a lot going for it. Related: What is Nike's role in the FIFA corruption scandal? Its sales rose 25% in the first quarter. Nike's revenues were up 13%. Under Armour's stock has soared 16% this year compared to a 7% gain for Nike. It's a continuation of a trend. 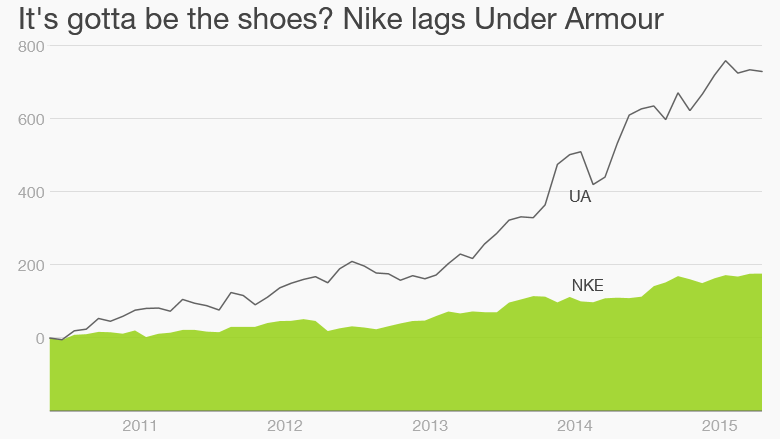 Shares have outperformed Nike by a wide margin over the past few years as well. Wall Street is also predicting that Under Armour's earnings will increase 23% annually over the next few years -- nearly double Nike's projected growth rate. The celebrities. In addition to its deal with Curry, Under Armour also sponsors Jordan Spieth -- who became a golf superstar this April after he won the Masters in a performance reminiscent of all-time greats Tiger Woods and Jack Nicklaus. New England Patriots quarterback Tom Brady endorses Under Armour, too. But Nike is no slouch when it comes to star athletes either of course. LeBron's teammate Kyrie Irving is on the Nike payroll. So are other NBA stars, such as Kobe Bryant and Chris Paul. Kevin Durant stayed with Nike after getting a big offer last year to jump ship for Under Armour. And a former player you may have heard of also still represents the Swoosh. Michael Jordan. Outside of basketball, Nike also has deals with Spieth rival Rory McIlroy and tennis stars Roger Federer, Rafael Nadal, Maria Sharapova and Serena Williams. Who does Wall Street like best? Sam Poser, an analyst with Sterne Agee CRT, has a "buy" rating on Under Armour and a "neutral" on Nike. Poser said that while Nike's business is "phenomenal," he is worried about the stock's valuation. Nike trades at nearly 26 times earnings estimates for its next fiscal year. Under Armour is much more expensive -- at about 54 times 2016 profit forecasts -- but Poser thinks Under Armour is worth it because of its sales and earnings momentum. Susan Anderson, an analyst with FBR Capital Markets & Co., agrees. She said Under Armour deserves the premium price and has the stock rated an "outperform" while Nike is a "market perform." "Nothing is necessarily wrong with Nike. It's just not growing as much," she said. Poser said Under Armour has more to gain from NBA Finals exposure than Nike does since Under Armour is a smaller company. Nike, Poser says, is already "the big Kahuna" of sports. If Curry plays well and the Warriors win, that could really boost Under Armour's awareness significantly around the world. "Under Armour is really hitting their stride as they look to break into footwear even more," Anderson said, adding that Under Armour could steal market share from Puma and Adidas (ADDYY) as it moves closer to Nike. "They have so much more room to grow. Their market share in international is still very tiny," she said. 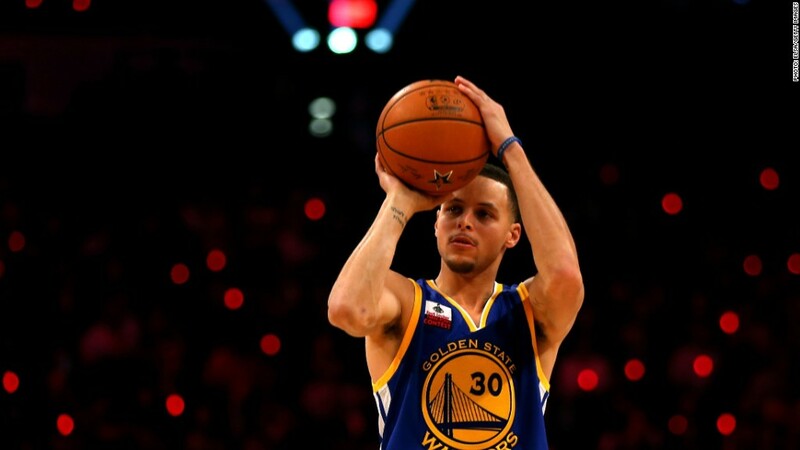 "The emergence of Curry is perfect timing."